Sources in attendance have told the Express that, during the meal, a protester ran at the mayor and threw a store-bought pie in his face. After this, the protester reportedly said something to Johnson, which prompted him to allegedly tackle the protester and punch him in the face “repeatedly,” more than half a dozen times, landing many of them. One witness described it as a “bloody pulp.” Ambulances and fire department arrived on the scene. There were nearly 200 in attendance at the dinner, including a few dozen high-school students, according to sources. After the event, sources say Johnson was given a change of clothes and then addressed the audience at the podium, apologizing, and receiving applause. Johnson even brought UFC fighter Urijah Faber, who was in attendance, up to the podium and joked about the assault. Please, if you have video of the pie throwing or the ensuing beatdown, send it to us at tips@deadspin.com. Wonder why anyone would be mad at this guy??? 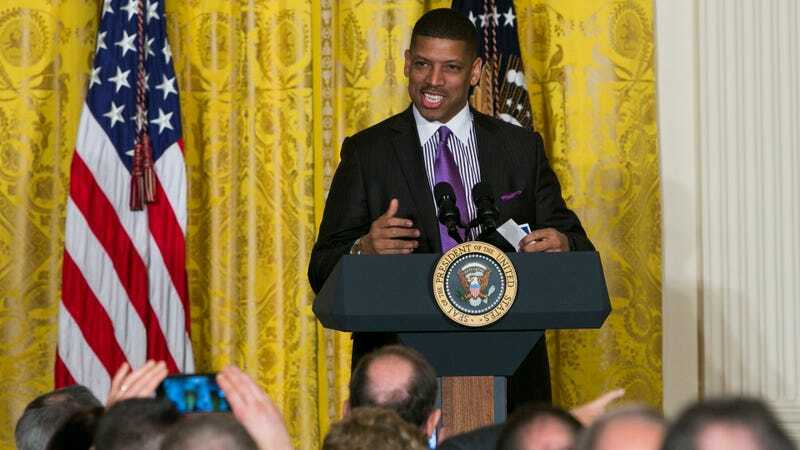 Who&apos;s Funding Kevin Johnson&apos;s Secret Government?